On the Manual Control fires the gas control valve is positioned at the base of the fire tray behind the ash pan cover. Our Smartslide Control fires feature a slider mounted to the side of the fire to turn the fire on, off and to regulate the flame level. 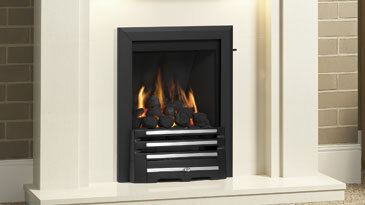 All our gas fires are open fronted except the Mid Depth (Imperium) and Deepline (Titanium) High Efficiency gas fires. The Deepline Convector gas fire (Velocity) is open fronted fire draws in air at the base which passes through a heat exchanger to emerge as a hot airstream through the top of the canopy. 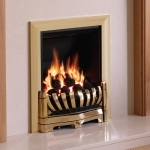 The Mid Depth H.E (Imperium) and Deepline H.E (Titanium) are our most efficient gas fires. 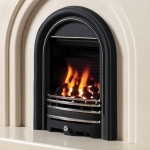 The technology works by placing a panel of ceramic glass across the front of the fire. This prevents air from being drawn from the room through the fire opening and then up the flue. As a result, a very high proportion of the radiant heat from the fire is concentrated into the room. Choose a gas fire because it’s clean, obedient and ready to make you feel at home. The instant you summon the warm, the warming flames will give you the appeal of an open fire without the fuss.